It’s hard to overstate the impact Stan Lee had on pop culture. The characters he created changed have entertained us for decades with their stories of daring do, but Lee also used his soap box for change and growth. From the X-Men to Black Panther, Stan Lee used his forum to try and reflect a light on our prejudices in an attempt to change the way we see the world, and each other. And on top of that, Lee was known for his gracious generosity to his fans. With appearances right up until the last year of his life, at 95, Lee was always happy to take a picture or listen to a fan gush about their love for him. Tributes are bound to be plentiful at Cons this year, but the first event celebrating Stan the man will be an all star tribute taking place at the TCL Chinese Theatres on Wednesday, January 30th. Presented by Legion M, Stan Lee’s POW! Entertainment, and Agents of Mayhem, and hosted by fan favorite, Kevin Smith, the event will feature a ceremony in the TCL Chinese Theatre forecourt where Lee had his hand and footprints immortalized in a ceremony in 2017, before then moving into the TCL Chinese Theatre for discussions of Lee’s life by celebrities such as Mark Hamill, Rob Liefeld (Co-Creator of Deadpool), Michael Uslan (Executive Producer, “The Dark Knight”), Vincent D’Onofrio, RZA, and Tom DeSanto (Producer, “X-Men,” “Transformers” franchise), and more to be announced. 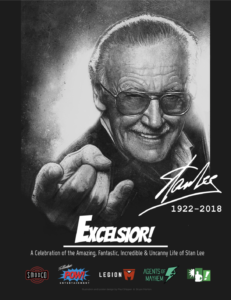 A limited number of tickets will be available to the public at https://legionm.com/stantribute starting at 5pm PST/8pm EST tonight, January 9th with all proceeds benefiting Lee’s favorite charity, The Hero Initiative, which benefits comic book creators in need.